Power FM personalities and the rest of ZBC members of staff took off to the streets of Harare CBD in a cleanup campaign which is a nationwide environmental project launched by President Emmerson Mnangagwa last year in December. The project offers a simple but bold blueprint for what we all can do as individuals, organisations, communities, and as a nation to bring about the realisation of a litter-free and more environmentally presentable country. 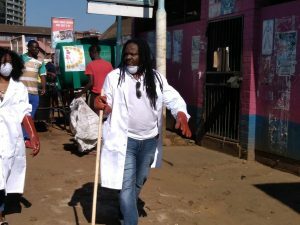 Tinashe Chikuse, the team leader highlighted the Power FM team was out to raise awareness to the Harare community for the general public to continue keeping the mother city clean. “This morning, we carried out a cleaning campaign in the city center at Copacabana Bus Terminus. The reason was to urge everyone to keep their surrounds clean,” he said.